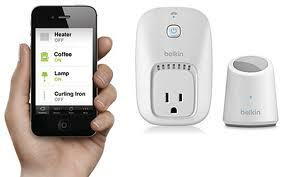 The Belkin WeMo for personal home automation allows you to control your home electronics from anywhere. The WeMo family of customizable products includes “Switch”, “Motion” and “Baby”. WeMo uses your home Wi-Fi network, and also operates over mobile internet, so you can control things while you’re away. WeMo is completely modular, allowing you to control as much or as little of your home as you like. The real advantage to the Belkin approach is that homeowners don’t need to run wires or incur costly upgrades to implement a home automation system. Being modular, a system can start with just a single WeMo and grow as desired. In addition to controlling appliances, you can also get feedback or status alerts. WeMo can interact with web-based social media and apps through a great service called IFTTT. When the front door opens, for example, you get a text or email. The WeMo Switch works in conjunction with a smart phone app to control anything plugged into it. From the app, you can turn the switch on, off or put onto a schedule. The Switch has built in wireless Ethernet and uses your existing home Wi-Fi network to provide wireless control of TVs, lamps, stereos, fans, portable heaters and more. Using a schedule, the Switch is expected to save users money (from lower electricity bills) and time. The second product, “Motion”, is a paired motion detector unit and a Switch. The motion detection unit can detect movement up to 10 feet away and wirelessly signals WeMo Switch to turn the connected device on or off, depending on your preference. The included 6-foot power cord lets you place WeMo Motion in the desired position. Great for night lights or turning on lamps when arriving home in the evening. WeMo “Baby” turns an iPhone into a baby monitor. This is an audio only application at this time, but it means there is one less device a parent has to carry. Announced at CES’2013 is the next device in the WeMo line-up, “Light Switch”. This looks like a standard light switch and installs into the same physical size wall junction box. It’s expected to work similar to any existing installed switches, with the added feature of being controllable via the WeMo app. This can be a much better approach to scheduling outdoor lighting rather than using light-level detectors. A dimming feature isn’t available, but that could be in the development. Expect to see the Light Switch out in mid-2013. One other request that Belkin is a addressing is for non-Apple users. They are working on an Android control app for WeMo systems targeting Galaxy phones first and rolling out to others in late 2013. Overall, the Belkin WeMo for personal home automation is an easy and affordable way to wireless control your home from an enabled smart device.